I'm really hoping your kids like burgers! Do they? I'm happy to report that both of mine do. We eat red meat in moderation, which I believe is the best thing to do with most foods. I love the fact that my boys get a lot of iron and protein from the burgers that they love so much. The flavor combination in these burgers is superb and makes them somewhat "fancy" for adults, while to the kids it's still just a yummy burger. For grown-ups I'd suggest adding Arugula, tomato, and lovely grainy mustard, between your favorite bun, of course. I always let my kids "build" their own burger, putting on the condiments of their choosing. It's more fun this way! In a medium sized mixing bowl, combine the beef with the cheese, artichokes and Ranch dressing. You might need to use your hands to fully combine everything. Season generously with salt and pepper. Coat the bottom of a large saute pan with olive oil and heat over medium-high heat. Add the burgers to the pan once it's hot and cook to the desired doneness, about 4 minutes per side for medium-well. 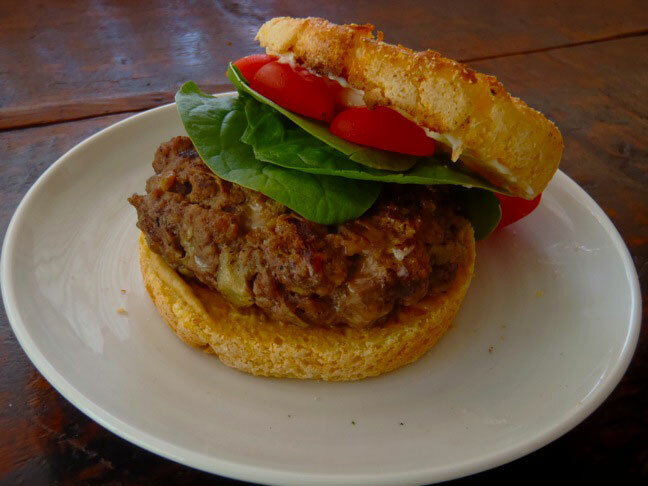 It's always a good idea to make a "test burger," when you're making burgers. Take a tiny bit of your seasoned beef mixture and cook it. Then, if necessary, adjust your seasonings before making the rest. You might also like Build Your Own Mini Cheeseburger!